Your body makes more cortisol, which can increase your appetite. Sometimes you can burn more calories when you are asleep than when you are just lying in bed. And it all has to do with our stages of sleep, specifically REM sleep. During REM sleep your brain is more active than any other stage. In fact in some cases it is MORE active than when you are awake. This activity requires fuel for thought called glucose - the basic building block of most foods. Your brain goes from: Wake to Stage 1, from Stage 1 to Stage 2, from Stage 2 to Stages 3 and 4, back to Stage 2 and on into REM sleep. You can see this in the graph above. But look at the yellow bar. 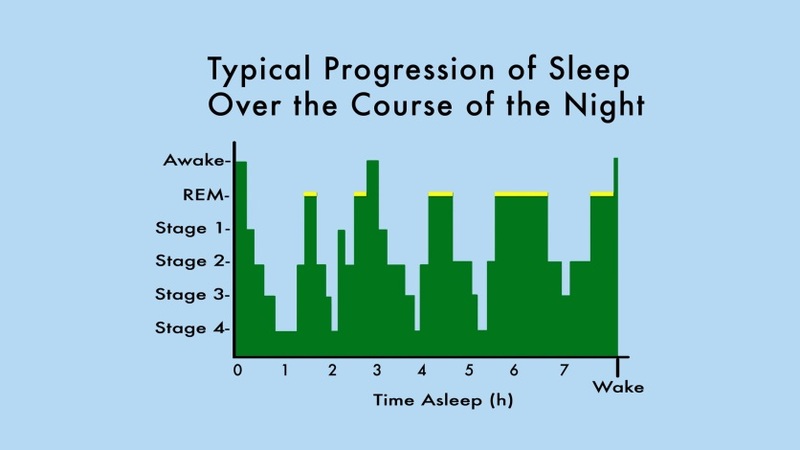 This represents REM sleep, and notice how it gets longer and longer as the night progresses! This shows how your body gets more REM sleep in the very early morning hours. Just like riding a bike up hill, you have to climb up before you can coast down that hill, and you need to go through the first few sleep cycles to get more REM sleep. But what happens when you only get 6 hours of sleep? YOU CUT OFF THAT LAST REM PERIOD which is where your brain uses the most calories! So what does that mean for your waistline? Over the course of a year, one research study from Sao Paulo showed this could add up to as much as 14 pounds of extra weight! So what can you do to sleep better and lose this weight? Lose the snooze and set your alarm to tell you when to go to bed. Use your alarm to help you know when to go bed to get the right amount of quality sleep. Don't use the snooze button to potentially interrupt those final minutes of REM sleep! Set your alarm in the morning for the last possible minute you need to be out of bed. Take a quick nap if you are feeling drowsy in the middle of the day, try my Nap-a-Latte™ technique: quickly drink a small cup of cool drip coffee, and then take a 25 minute nap. The Nap-a-Latte™ reduces your drowsiness and the caffeine will wake you up, but taken at the right time (no caffeine after 2 p.m.!) will not keep you awake at night. Stop exercise 4 hours before bed Work out earlier in the evening and consider Yoga, deep breathing or stretching before bed. Have your breakfast outside in the morning, and get plenty of sunlight to help re-set your internal biological clock. Sleep loss affects weight loss - from your ability to burn calories to the food choices you make. Start with a commitment to sleeping better - and you may find yourself a few pounds lighter without changing anything else. Your body can naturally start making better food choices and wanting to get up and move, because you will be refreshed and energized every morning! Understanding your sleep, and feeling empowered to be able to get the rest you know need is amazing. I am 64 years old and 6' tall. The following is a typical occurance. I weighed 213.1 lbs before I went to bed last night. Immediately upon waking I weighed myself with same bed clothing and I weighed 209.0. That is a 4.1 pound difference. I slept 7.5 hours with 2 unmeasured, but small/normal unrinations between. My dreams were not the relaxing type. Although this night time weigh loss does not occur every night..... it occurs about 3-4 times a week and has been occuring for at least 20 years. To rule out scale error, I purchased a new scale and the results are the same. I have no night sweats or any other unusual symptom. I audio recorded my nights for about a week and only recorded a few coughs and an occasional sigh. My weight gradually increases from a morning low to an evening high. Marcelle Pick in her book, "Are You Tired and Wired?" advocates getting plenty of sleep. Not only will you feel better and be better rested, but it does in fact help your weight. Michael J. Breus, Ph.D., is a clinical psychologist and a diplomate of the American Board of Sleep Medicine. He is the author of Beauty Sleep. This is the future of testing for sleep issues. What Is Intermittent Fasting, and Will It Help Your Sleep? Fasting—an ancient practice that’s new again. A good rest is vital to our health and sanity, but it eludes many of us. Too often, the greatest stumbling block to zzz's is ourselves. Aging, Eyes and Our Circadian Clock: What's the Connection? Valerian: A Help for Post-Menopausal Insomnia? Get Out of Bed for Better Sleep? The New Generation of Weight-Loss Drugs: Which Is Best?